"We're beginning to understand now that it was more Romanized, more in line with the rest of the Roman world than was suspected before. (The nature of the mosaic) hammers home how Roman this city truly is." The boffins reckon the mosaic was the floor of a roofed forecourt for the large bath beside it, which featured a marble-lined, 25-foot-long pool that would have been left open to the sun. 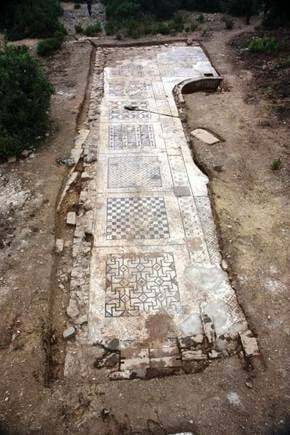 They also believe that a second half to the mosaic, which still has to be uncovered, will have the same patterns of decoration. Hoff and his team have been digging on the south Turkish coast since 2005, excavating the remains of the ancient city of Antiochia ad Cragnum, founded by Antiochus of Commagene, a client-king of Rome, in the middle of the first century. The city held all the typical wonders of the ancient Roman world: temples, baths, markets and colonnaded streets, some of which has been discovered by the team. A third-century imperial temple and a colonnaded street lined with shops have both now been dug up.